The German Sixth Army on the Way to Catastrophe. ON 30 JUNE 1942 the Sixth Army had left its jumping off point east of Belgorod, and was advancing for the attack. After two days of hard defensive fighting the Russian resistance appeared to be broken, and the Germah units went over to the pursuit. It appeared, however, that the Russian retreat was being conducted on the basis of previous plans, for during the delaying action of the withdrawal to the southeast not a single article of equipment was left behind and the number of prisoners taken was small. The extensive Russian minefield considerably slowed the German advance. But by 20 July 1942 the main body of the Sixth Army was astride the upper course of the Chir. The Sixth Army South of the Don. The original German plan of operations had called, for the conquest of the southern Russian area in chronological phases. First, Army Group B, with its Sixth Army and First and fourth Armored Armies, was to seize Stalingrad and the lower Volga and establish a defense front between the Don and the Volga. After this, Army Group A was to seize the Caucasus area to the south. The German Supreme Command (Hitler) looked forward to the enemy’s collapse as a result. It was fairly certain that the strategic objectives of this plan would be reached before winter, even though the resultan anticipated had to remain very doubtful, if not dismissed as purely Utopian. However, in view of the successful advance of the Sixth Army, the High Command decided that the Soviet defense was so shattered already that only fractional forces were now necessary to bring about the collapse of the Don-Volga front. 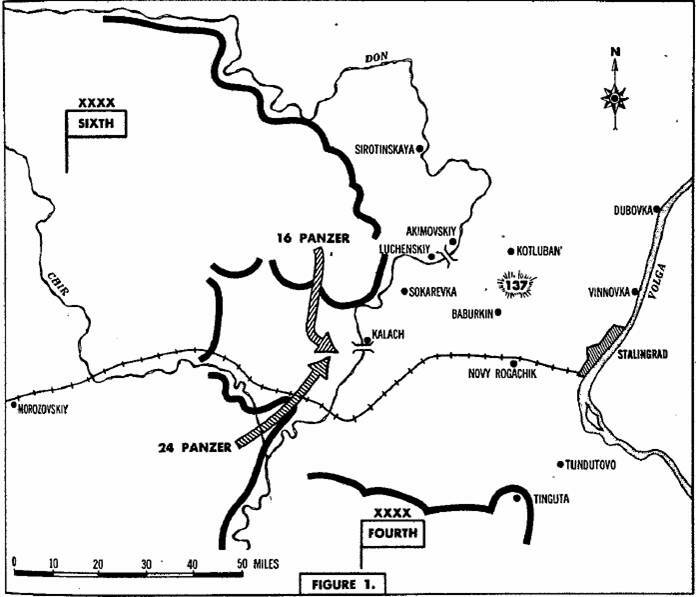 Under the impulse of this wishful thinking, the original operations plan was discarded and a new directive issued which allotted to Army Group B with its Sixth Army and Fourth Armored Army, the Don bend - Volga bend operations objective while, at the same time, Army Group A was assigned the mission of the conquest of the Caucasus area. The idea of any point of main effort was dissipated by this dispersal of forces. and with the forces available, it seemed logical, in July 1942, that the Sixth Army would reach the crown of the great Don bend at Kalach in a few days. But many rapid moving, hard-hitting units, and large quantity of transport materiel were transferred to Army Group A with the change in plans. At the moment (22- 24 JuIy) when everything depended on rapid action and concentrated effort, an armored division and two motorized divisions were left without transport and incapable of movement. About the same time, the Russian Command obviously had decided to defend Stalingrad, not at the gates of the city but on the west bank of the Don, and on 25 July assembled forces in the hilly country northwest of Kalach. A battle took place which put the Sixth Army formations (which were in a critical situation with respect to supply) in a most difficult situation.The enemy not only brought forward his armored and infantry divisions at Kalach, but also those farther north in the vicinity of Akimovskiy across the Don. As a result of this, the Sixth Army was obliged to fight a battle on two fronts. It was forced from successful pursuit to defense. The massed Russian attacks, supported by hundreds of tanks, eventually were repulsed. the German side. The divisions again began to receive motor fuel and ammunition from the supply bases hundreds of miles to the rear. The German Army gained the initiative. It saw the opportunity not only of beating the enemy installed in a broad, risky semicircle about Kalach, but of annihilating him by a double pincers action along the Don. The attack began early in the morning of 7 August; about 20 hours later, the points of the 16th Armored Division (from the north) and of the 24th Armored Division (from the south ) met on the heights west of Kalach. The Russian Sixty-fourth Army and the First Armored Army, cut off by this operation; capitulated three days later. The enemy - in addition to many casualties - lost 1,000 tanks and 750 guns. Fifty two thousand Russians were taken prisoner. However, the combat strength of the Sixth Army divisions also had been seriously impaired. Their losses were felt more since replacements were not available. On 29 July General von Paulus had declared that: “The army is too weak for the attack on Stalingrad”. And a day later, the Chief of the Army General Staff, Major General Schmidt said: “The farther east we get the weaker we become.” His urgent request for two or three infantry divisions was turned down. The combat strength of the Sixth Army was reduced still further on 10 August by the withdrawal of an armored and an infantry division. The enemy had been beaten in a battle of annihilation. He had, however, gained time—which he employed in a most advantageous way—by his decision to prepare a defense position west of the Don. In view of his inexhaustible human reserves this gain of time was of greater weight than the losses he had suffered at Kalach. At dawn on 21 August two divisions crossed the Don in the face of violent enemy defense action. By evening they had secured a wide bridgehead. 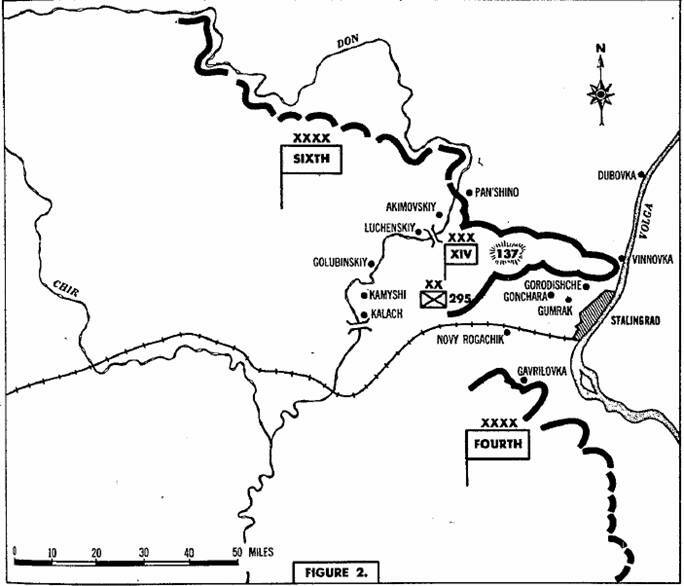 At noon, 22 August, the 16th Armored Division and the 3d Motorized Division of the XIV Armored Corps crossed the Don and made ready, in the bridgehead, for their attack eastward. On the same day General Panlus declared: “ We shall attack tomorrow from the bridgehead with all our forces, over Hill 137. If it succeeds, we must count on the mobile divisions alone remaining for a while on the hills northwest of Stalingrad. The 76th and 295th Divisions have little combat strength, so that the thrust will not be strong—particularly, we shall have difficulty in the matter of cover on the south I repeat it once more, that we are two infantry divisions short". This estimate of the commander in chief of the army was to find its full confirmation in the way the fighting progressed during tbe following weeks. The 16th Armored Division had 81 tanks at its disposal, and the 3d Motorized Division had 42. A few days later the 60th Motorized Division arrived with 40 additional tanks. Altogether, therefore, the Sixth Army had only 163 tanks for its attack on Stalingrad. The Drive to the Volga. On 23 August the XIV Armored Corps drove forward over Hill 137 and to the east, securing itself with weak fractional forces in the Kotluban area against enemy action from the north. By 1700 the scout tanks of the 16th Armored Division were already south of Vinnovka on the steep bank of the Volga. Since interruption of the weakly held terrain bridge between the Don and the Volga could be expected during the ensuing night, air supply of the XIV Armored Corps was ordered. On 24 August the Russians counterattacked with numerous tanks from the direction of Dubovka and Panshino. The Akimovskiy bridge across the Don was partially destroyed by Russian bomber attacks with the result that this military route was closed to traffic for two days. The expected interruption of the highway east of Hill 137 was brought about on 25 August. The connections of the XIV .Armofed Corps with the west were now broken. A combat team from the 60th Motorized Division, which was crossing theDon, was given the mission of opening the way to the east again. The 71st Division forced its way across the Don north of Kalach and took Kamyshevski. At the same time the 295th Division was progressing to the south. The376th Division, 28 percent; 398th Division,32 percent; 384th Division, 30 percent; and the 305th and the 71st Divisions, 36 percent. They were reduced, therefore, to companies of from 40 to 50 men. In contrast with this the companies of the Russian infantry division showed strength of from 150 to 180 men. The XIV Armored Corps was placed in such a threatening situation by a powerful, methodical Russian attack—from both the north and south—that the corps command proposed its Volga group move to a position back of Hill 137 during the night of 26-27 August. Since the highway was now cut on Hill 137 itself, the Army High Command turned down this proposal very emphatically and demanded resistance a outrance until the LI Army, Corps, attacking from the west, should bring relief. This corps finally arrived on 29 August. The drive against Stalingrad itself had to be halted. It was resumed again hy an army group order on 30 August, since the Fourth Armored Army on that day had ruptured the Russian lines at Gavrilovka. For this reason the Sixth Army, in spite of the extremely critical defense situation, directed the XIV Armored Corps and the LI Army Corps to attack in a generally southern direction with the final objective of annihilating the enemy forces west of Stalingrad. Armored Corps—was repulsed on 2 September, the fractional forces of the 60th Motorized Division and 295th Division gained ground in the direction of Gonshara-Gumrak. Early on 3 September, contact was established southeast of Gonshara with the 24th Armored Division of the Fourth Armored Army. Even thoug a considerable tactical success had been achieved, on the same day the northern front of the XIV Armored Corps again was badly overrun by the Russians. It was only possible to repel the Russian attacks at the cost of serious losses, and the use of the artillery of the 60th Motorised Division which was fighting with its front to the south. An enemy attack of from nine to ten infantry divisions and five to seven armored Brigades against the north occurred on 5 September. By the use of all available reserves and the expenditure of unusual quantities of ammunition—and at the cost, again, of very considerable losses—they were repelled. The loss of 114 tanks on the Russian side did not, in view of the increasingly critical situation of the XIV Armored Corps,give rise to any illusions. The combat strength of the German armored infantry and rifle regiments visibly was disappearing; ammunition reserves were dwindling as a result of insufficient transport capacity. The mobile units of the armored corps were being worn down. 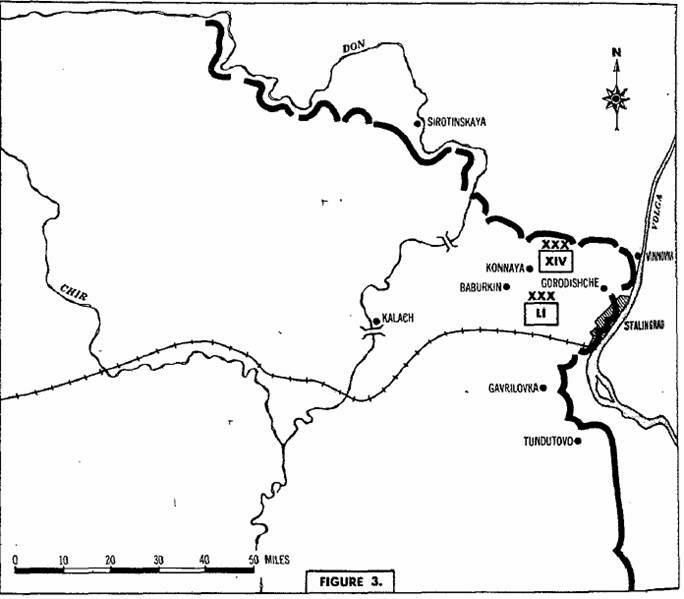 Two days later the LI Army Corps succeeded in effecting a four-mile-deep penetration on both sides of Gorodishcbe, which on 9 September was widened in a northerIy direction against a bitterly fighting enemy. On 13 September the LI Army Corps set out to the southeast toward the heart of the city of Stalingrad, whose outlying areas were taken. On the following day, two divisions with about a one-mile front, forced their way through the city and all the way to the Volga. The main railway station fell into their hands. For the continuation of the attack on Stalingrad, on 15 September, three divisions of the Fourth Armored Army were placed under the orders of the Sixth Army. The attack of the two corps gradually cut its way into the city in costly house to house fighting. (Figure 3.) In three days the LI Army Corps lost 61 officers and 1,492 men. the use of the Sixth Army. In addition to the need for more forces there was a growing shortage of ammunition for 10-centimeter and 7.5-centimeter cannon, and 8-centimeter mortars. The heavy mortar regiment was without a round of ammunition. The reverse of this was true in the case of the enemy, who had continuing reinforcement and supply. On 23 September the Soviet tanks drove through the main line of defense in the east wing of the VIII Army Corps south of Kotluban, and cut the supply route north of Bal Rososhka, where they were destroyed on 25 September. The impossibility of making up for the heavy losses of the frontline units, reduced to one-third or one-fifth of their original etrength, the insufficient supply, and the continually increasing enemy resistance were matters which required halting the attack on the Stalingrad blood mill, and indicated the necessity for pulling back the front at least to the west bank of the Don. The objection that such a withdrawal movement was prohibitory because of Army Group A, which was fighting in the Caucasus, was without foundation, for its attack, too, was halted due to lack of forces. Every attempt at resuming the attack thus far had failed in the face of the stubborn resistance of the numerically and equipment-wise superior enemy. The hopelessness of the prospect of being able to achieve the objectives assigned to Army Group A should have led to a withdrawal to the lower course of the Don or to the east side of the Crimean peninsula. But the requests and proposals of Army Group B and of the Sixth Army fell on deaf ears. Serious opposition to Hitler’s measures, as leader, had, up to this point, led only to the deposition of the objectors. And so, for the Sixth Army the trail was blazed to catastrophe.